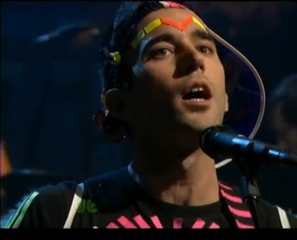 Never thought i’d mention sufjan and gaga in the same sentence, but this stage getup would make lady gaga proud. Music is good though! I’ll just close my eyes and listen. Very apropos “Lost in Space” insight. On further reflection, Adam Ant would seem to be an influence too. The horns were impeccable live. Edward Sharp meets Lost in Space with Jim James on horns. Wow is all I can say.